So, here we are again. What is it with me and box art? Honestly, I have no idea--other than I really like it (box art), I mean. If you're also a fan of box art, hopefully you'll dig the recently-ish released examples below, each of which should show up on Japanese store shelves sooner rather than later. This first one is for the PS Vita "Premium Box" version of Atelier Ayesha Plus, as you've probably already surmised. I'm also pretty fond of the cover art that's going to be used for this game's regular release (check it out here), I have to say, but I like this one even more due to the presence of that goat-lamb creature. 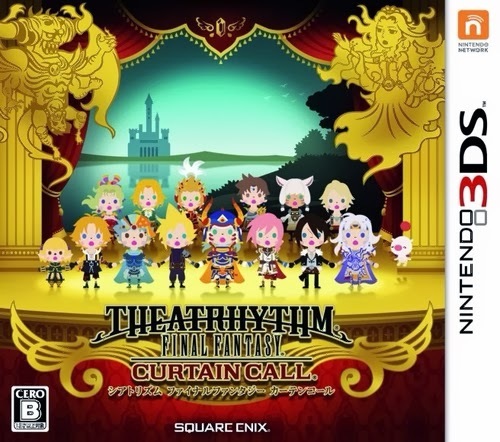 I really, really liked the illustration that was created for the first Theatrhythm title's case cover, so I expected to like this one, too. And you know what? I do! Hopefully if the powers that be at Square Enix decide to release it elsewhere they'll leave the box art alone. The box art above is for what looks to be a Wizardry clone called Tsurugi no Machi no Ihoujin (or, Stranger of the Village of the Sword). 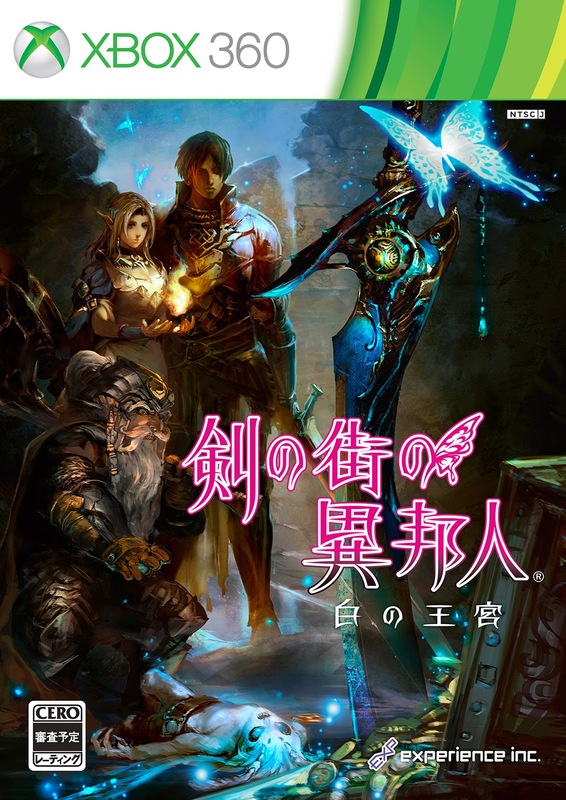 Apparently the game's also going to be released for the Vita, so hopefully some brave company will localize that version for other regions (and of course use the same cover illustration). 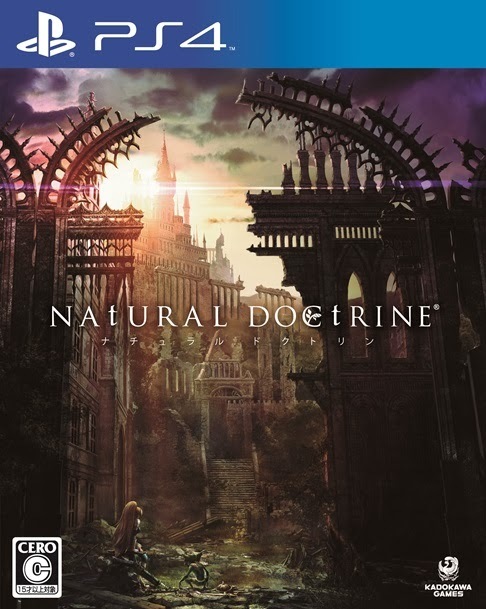 Finally, there's Natural Doctrine, another upcoming title I know next to nothing about--other than it's a PS4 game that's being published by Kadokawa Games, I mean. I do believe I've read that it's been announced for North American release, though, so I'm guessing we'll all learn more about it shortly. Do any of the pieces of cover art above make your heart race, too? If so, which ones--and why? That Atelier cover really pushes the right buttons for me. (The sheep/goat is definitely a plus!) I like the regular cover too but I think this one especially conveys that light-hearted world the games seem to take place in, and of course, the airy colors are really nice. I like the other covers here too but that one really stands out. On that same link with the regular edition, I have to admit I'm a sucker for the Moero Chronicle covers too. Have you ever played any of these games, Michael? I really want to give them a try at some point. Of course, I'm going to have to get a PS3 or Vita for that to happen, I guess. 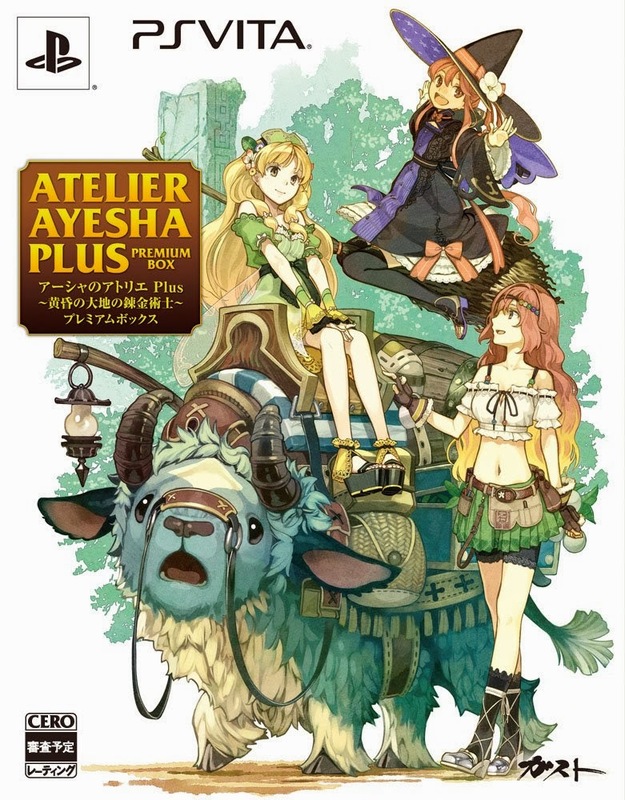 The cover art of Atelier Ayesha Plus is excellent and one of the best I've seen in a very long time. And I'm really interested in that 360/PSV Wizardry game as well. Thanks!!! I think that the Monster Hunter series with the cats would sell a lot of copie (probably among the children and tween game playing groups). I emailed the company about whether they'd translate these Monster Hunter cat games and the Wantame games but I was told that they have no plans to do so in the near future. :( For people who do not know, Wantame is the DS series where you can dress your dog up. It looks like they can compete against other dogs as well. I think that it would be popular among children. There is the fruit ninja series out now. One of the games that I think looks neat (but will probably not be translated into English) is "Kumamon Bomber Puzzle de Kumamon Taisou" for the 3DS. Kumamon is a black bear chara yuru. There is a whole group of what I think are local mascots in Japan called chara yuru. Most of them are really cute. Kumamon is one of the most famous ones as he won a contest I think. Anyway, I think that the chara yuru are not only cute but they are an educational way to promote things (usually Japanese towns and tourist areas). I would love to see more games featuring Kumamon and other chara yuru. Even if people did not know Kumamon's history, I think this 3DS game would be popular (probably with parents wanting to buy a child friendly game). I would use it but not for groceries. I think that there was some Japanese specific ACNL items developed for use in the game. I remember seeing a post about a company that makes Campus notebooks and they had a promotion in Japan where you could get products for your in game house. It seems like Japan gets some of the cutest things ever! There is a game called Kuma Tomo where you get to interact with a bear (the bear reminds me a lot of Snuggles from the fabric softner). It looks so cute but I doubt that they will bother to translate it into English (even though I think it would be very popular with children). I get so frustrated some times that it seems like the Japanese have perfected a lot of different things (usually involving cuteness) but they rarely make it outside of Japan. Yeah, that box/logo doesn't quite live up to the rest of the design, does it? I don't think I would use this if I didn't use it for groceries, honestly. Which is too bad. I've heard of Kuma Tomo, by the way. In fact, one of the blogs I frequent -- http://www.japanese3ds.com/ -- absolutely loves the game. I'm not sure it's something I'd buy, but I hope it's released outside of Japan eventually so folks like you can buy and play it! Haha, yeah, they are classified as cows in the Ayesha-verse - this particular one is Pana, Ayesha's pet-friend and these cows go "Oink-Moo!" whenever you meet them.. that actually makes me crack up every time I play the game, haha. I know, miruki. Someday! Which one should I start with, though--you know, once I finally get around to starting the series? Ah, I love it! And I'm curious about Escha and Logy, but what else is new, right? I'll be picking up Ken no Machi no Ihoujin -- actually didn't know about it until I saw this post, but I liked Experience's previous games, in large part due to the cool music. And I agree, that's a nice cover... feels somewhat oldschool in its sensibilities. Really, Zig? That's awesome! Are you a Wizardry fan, or a Wizardry-esque fan? Or are you just looking for a game for your Japanese 360 or Vita? I dig dungeoncrawlers in general -- including Wizardry! "Students of the Round" was another decent one by Experience, released on both 360 and PSP. Hmmm, I'll have to look up that one, Zigfried. Don't remember hearing about it before! Of course, I think a number of games for both systems missed my attention during this past generation (the 360, especially).